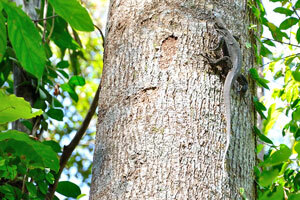 Wild monitor lizard tries to run away from me. 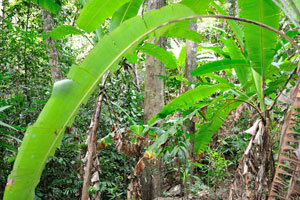 First time our jungle trekking was from Arwana and these banana plants welcomed us at the start. 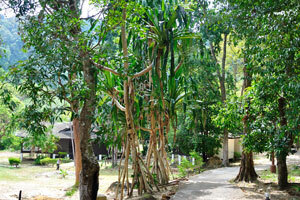 If you start from Arwana you will see a picture which reminds an easy and comfortable footpath in the park. 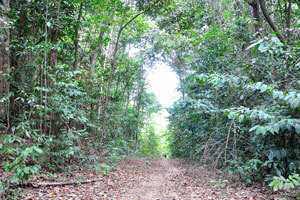 This jungle trekking is the longest and the easiest on the Besar island. 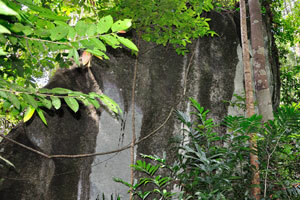 While you go by the jungle trek you will see the huge stones. 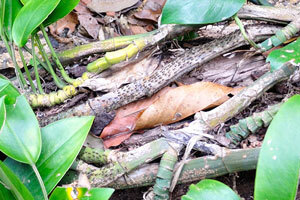 Deep thickets will surround you. 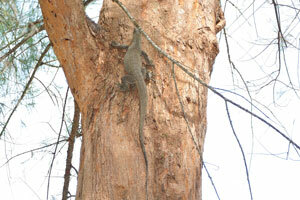 We are not alone on the footpath. 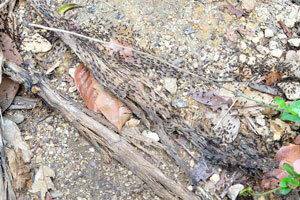 Numerous horde of ants moves on the trail. 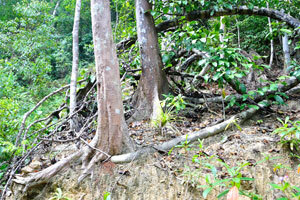 Besar is crossed by small paths connecting one beach to another, but be prepared to sweat. 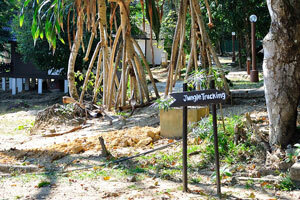 If you want to start your trekking from PIR you should go along this container which serves as a pointer. 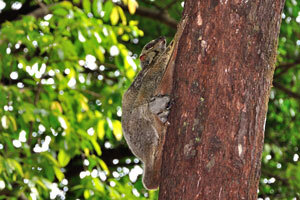 My son has found flying lemur on one of the trees near Teluk Pauh beach. 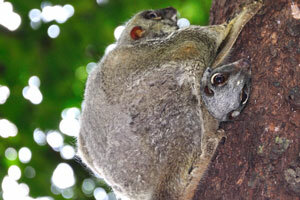 Sunda flying lemur with its baby. 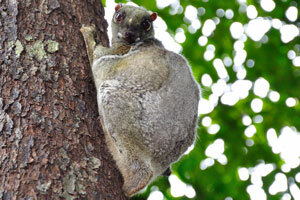 Sunda flying lemur “Galeopterus variegatus”. 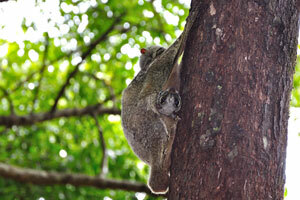 Sunda flying lemur, also known as the Malayan flying lemur or Malayan colugo, is a species of colugo. 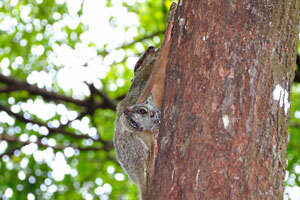 It was a real miracle for me to find the flying lemur on Besar. 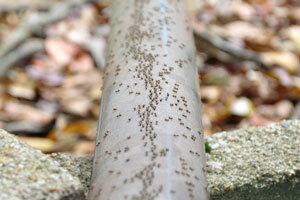 Ants move on the pipe. 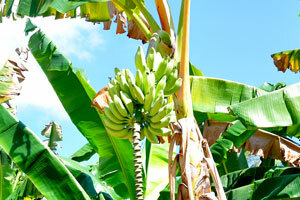 Common screwpines grow on the sunny PIR territory. 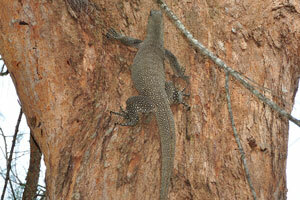 Spotted monitor lizard climbed a tree. 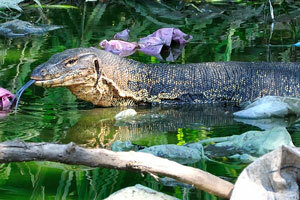 Timor monitor or spotted tree monitor “Varanus timorensis” is a species of small monitor lizards. 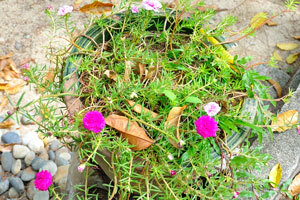 Magenta flowers nicely bloom in the flower pot on the ground. 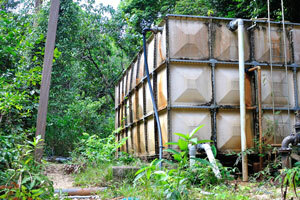 Water on the Teluk Pauh beach has a stunning emerald color. 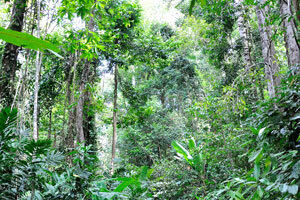 This signpost is located on the PIR territory and indicates where the jungle trekking begins. 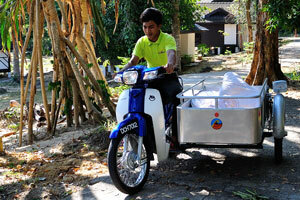 I suppose that this motorcyclist is the employee of Perhentian Island Resort. 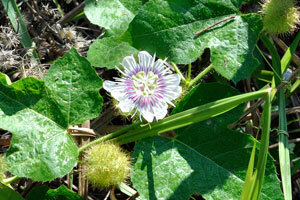 You can find the flowers of passiflora on the jungle trek. 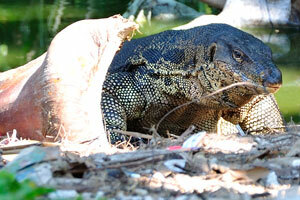 When monitor lizards saw me coming, they took to their heels. 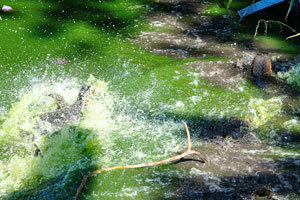 Monitor lizards tried to escape from me and it was like a water explosion. 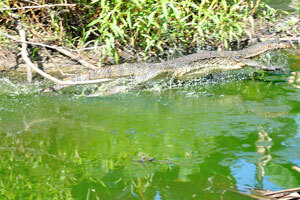 Monitor lizard is running away at impressively high speed leaving splashes behind his back. 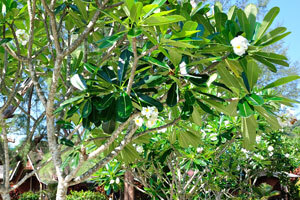 Huge pachypodium plants in bloom. 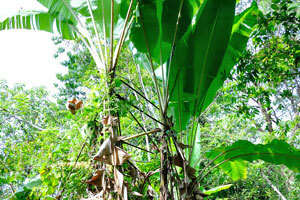 Banana plants with the fruits. 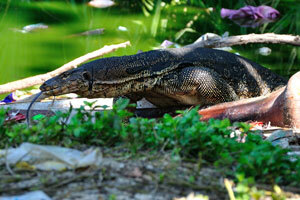 Big monitor lizard in its living environment. 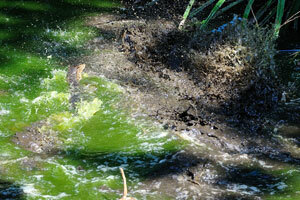 Monitor lizard swims in the puddle not far from Arwana. 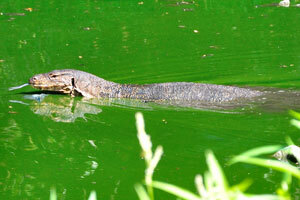 Big monitor lizard sticks his tongue out while swims. 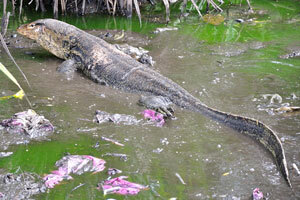 Best habitat for the big monitor lizard on Besar is the puddle with litter. 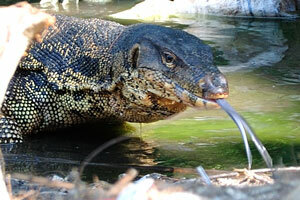 Big monitor lizard sticks his blue forked tongue out. 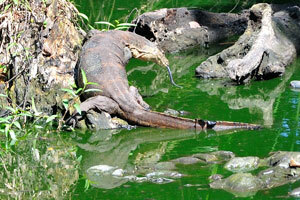 Central jungle trek on the Besar island is an excellent trail to see monitor lizards. 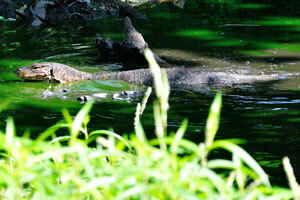 This time we were only three meters away from the monitor lizard. 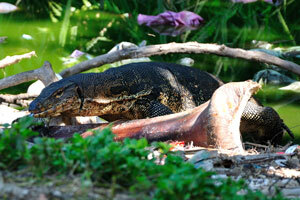 Why does monitor lizard stick his tongue out so frequently? 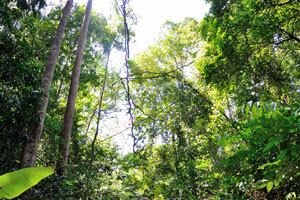 Experience the central jungle trek because it is the best jungle trekking on Besar! 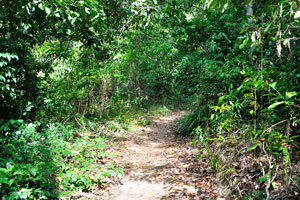 Central jungle trek is light and easy, therefore we can call this adventure as “jungle hiking”. 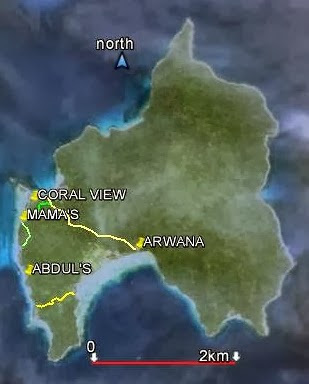 You can see all three trails on the first map. 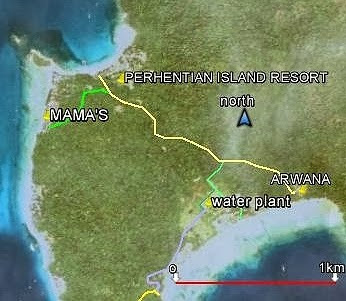 Wide trail between Arwana and PIR is pointed on the second map.